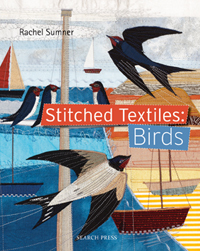 Birds are an enduring theme in art and textile work and this book will appeal to any textile artist interested in exploring their design possibilities. Featuring a range of birds including much-loved garden blackbirds, characterful chickens, cute and curious puffins and cheeky seagulls, this book captures these feathered friends in a range of habitats. Fresh and innovative in its approach, it covers the design process itself, from inspiration to final design, and provides information on the materials used and step-by-step demonstrations of a whole range of techniques including dyeing, using dissolvable fabric, using found objects, piecing and stitching. The book is broken down into three chapters: Creating character, Depicting a scene and Telling a story. Each chapter contains two step-by-step projects and a gallery of other inspiring, vibrant pieces. The purpose of each chapter is to capture a different aspect of the characters of the birds we love to watch, either in our gardens, as pets or in the wild. Very much aimed at the contemporary textile artist, this beautiful book is designed to inspire and encourage.